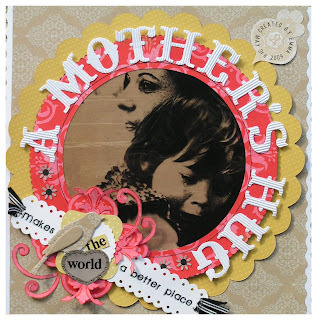 Mothers day Challenge Chics challenge at Deb's Creations, May 2009. I printed the image on a Transparency purely because the photo was a little damaged, then masked the areas that needed editing with black masking fluid, I think it turned out okay and have found a new exciting material in the transparency, its such a versatile medium to use with stamping, rub-ons and Dimensional Magic . i love this layout. the tears are heartbreaking. just gorgeous.